Learn how to optimize charging conditions to extend service life. Lead acid batteries should be charged in three stages, which are  constant-current charge,  topping charge and  float charge. The constant-current charge applies the bulk of the charge and takes up roughly half of the required charge time; the topping charge continues at a lower charge current and provides saturation, and the float charge compensates for the loss caused by self-discharge. During the constant-current charge, the battery charges to about 70 percent in 5–8 hours; the remaining 30 percent is filled with the slower topping charge that lasts another 7–10 hours. The topping charge is essential for the well-being of the battery and can be compared to a little rest after a good meal. If continually deprived, the battery will eventually lose the ability to accept a full charge and the performance will decrease due to sulfation. The float charge in the third stage maintains the battery at full charge. Figure 1 illustrates these three stages. Figure 1: Charge stages of a lead acid battery. The battery is fully charged when the current drops to a set low level. The float voltage is reduced. Float charge compensates for self-discharge that all batteries exhibit. The switch from Stage 1 to 2 occurs seamlessly and happens when the battery reaches the set voltage limit. The current begins to drop as the battery starts to saturate; full charge is reached when the current decreases to 3–5 percent of the Ah rating. A battery with high leakage may never attain this low saturation current, and a plateau timer takes over to end the charge. 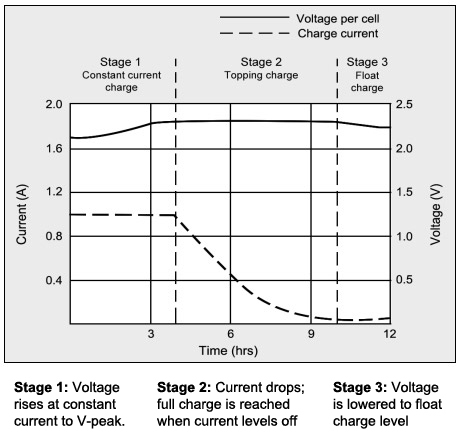 The correct setting of the charge voltage limit is critical and ranges from 2.30V to 2.45V per cell. Setting the voltage threshold is a compromise and battery experts refer to this as “dancing on the head of a needle.” On one hand, the battery wants to be fully charged to get maximum capacity and avoid sulfation on the negative plate; on the other hand, over-saturation by not switching to float charge causes grid corrosion on the positive plate. This also leads to gassing and water-loss. Temperature changes the voltage and this makes “dancing on the head of a needle” more difficult. A warmer ambient requires a slightly lower voltage threshold and a colder temperature prefers a higher setting. Chargers exposed to temperature fluctuations include temperature sensors to adjust the charge voltage for optimum charge efficiency. The charge temperature coefficient of a lead acid cell is –3mV/°C. Establishing 25°C (77°F) as the midpoint, the charge voltage should be reduced by 3mV per cell for every degree above 25°C and increased by 3mV per cell for every degree below 25°C. If this is not possible, it is better to choose a lower voltage for safety reasons. Table 2 compares the advantages and limitations of various peak voltage settings. Maximum service life; battery stays cool; charge temperature can exceed 30°C (86°F). Higher and more consistent capacity readings; less sulfation. Slow charge time; capacity readings may be inconsistent and declining with each cycle. Sulfation may occur without equalizing charge. Subject to corrosion and gassing. Needs water refill. Not suitable for charging at high room temperatures, causing severe overcharge. Table 2: Effects of charge voltage on a small lead acid battery. Cylindrical lead acid cells have higher voltage settings than VRLA and starter batteries. Once fully charged through saturation, the battery should not dwell at the topping voltage for more than 48 hours and must be reduced to the float voltage level. This is especially critical for sealed systems because they are less tolerant to overcharge than the flooded type. Charging beyond the specified limits turns redundant energy into heat and the battery begins to gas. The recommended float voltage of most flooded lead acid batteries is 2.25V to 2.27V/cell. Large stationary batteries at 25°C (77°F) typically float at 2.25V/cell. Manufacturers recommend lowering the float charge when the ambient temperature rises above 29°C (85°F). Not all chargers feature float charge and very few road vehicles have this provision. If your charger stays on topping charge and does not drop below 2.30V/cell, remove the charge after 48 hours of charging. Recharge every 6 months while in storage; AGM every 6–12 months. These described voltage settings apply to flooded cells and batteries with a pressure relief valve of about 34kPa (5psi). Cylindrical sealed lead acid, such as the Hawker Cyclon cell, requires higher voltage settings and the limits should be set to manufacturer’s specifications. Failing to apply the recommended voltage will cause a gradual decrease in capacity due to sulfation. The Hawker Cyclon cell has a pressure relief setting of 345kPa (50psi). This allows some recombination of the gases generated during charge. Aging batteries pose a challenge when setting the float charge voltage because each cell has its own unique condition. Connected in a string, all cells receive the same charge current and controlling individual cell voltages as each reaches full capacity is almost impossible. Weak cells may go into overcharge while strong cells remain in a starved state. A float current that is too high for the faded cell might sulfate the strong neighbor due to undercharge. Cell-balancing devices are available compensate for the differences in voltages caused by cell imbalance. Ripple voltage also causes a problem with large stationary batteries. A voltage peak constitutes an overcharge, causing hydrogen evolution, while the valley induces a brief discharge that creates a starved state resulting in electrolyte depletion. Manufacturers limit the ripple on the charge voltage to 5 percent. Much has been said about pulse charging of lead acid batteries to reduce sulfation. The results are inconclusive and manufacturers as well as service technicians are divided on the benefit. If sulfation could be measured and the right amount of pulsing applied, then the remedy could be beneficial; however giving a cure without knowing the underlying side effects can be harmful to the battery. Most stationary batteries are kept on float charge and this works reasonably well. Another method is thehysteresis charge that disconnects the float current when the battery goes to standby mode. The battery is essentially put in storage and is only “borrowed” from time to time to apply a topping-charge to replenish lost energy due to self-discharge, or when a load is applied. This mode works well for installations that do not draw a load when on standby. Lead acid batteries must always be stored in a charged state. A topping charge should be applied every 6 months to prevent the voltage from dropping below 2.05V/cell and causing the battery to sulfate. With AGM, these requirements can be relaxed. Observe the storage temperature when measuring the open circuit voltage. A cool battery lowers the voltage slightly and a warm one increases it. Using OCV to estimate state-of-charge works best when the battery has rested for a few hours, because a charge or discharge agitates the battery and distorts the voltage. Watering is the single most important step in maintaining a flooded lead acid battery; a requirement that is all too often neglected. The frequency of watering depends on usage, charge method and operating temperature. Over-charging also leads to water consumption. A new battery should be checked every few weeks to estimate the watering requirement. This assures that the top of the plates are never exposed. A naked plate will sustain irreversible damage through oxidation, leading to reduced capacity and lower performance. If low on electrolyte, immediately fill the battery with distilled or de-ionized water. Tap water may be acceptable in some regions. Do not fill to the correct level before charging as this could cause an overflow during charging. Always top up to the desired level after charging. Never add electrolyte as this would upset the specific gravity and promote corrosion. Watering systems eliminate low electrolyte levels by automatically adding the right amount of water. Choose the appropriate charge program for flooded, gel and AGM batteries. Check manufacturer’s specifications on recommended voltage thresholds. Recharge lead acid batteries after each use to prevent sulfation. Do not store on low charge. The plates of flooded batteries must always be fully submerged in electrolyte. Fill the battery with distilled or de-ionized water to cover the plates if low. Never add electrolyte. Fill water level to designated level after charging. Overfilling when the battery is on low charge can cause acid spillage during charging. The formation of gas bubbles in a flooded lead acid indicates that the battery is reaching full state-of-charge. (Hydrogen appears on negative plate and oxygen on positive plate). • Lower the float charge voltage if the ambient temperature is higher than 29°C (85°F)..
Do not allow a lead acid to freeze. An empty battery freezes sooner than one that is fully charged. Never charge a frozen battery. Avoid charging at temperatures above 49°C (120°F).